Born in 1993 in Saint Petersburg, Russia. in 2016 obtained the MA degree in Asian and African Studies (Asian and African History). From June 2017, an assistant researcher, from April 2018, an academic secretary at the Section of Central Asian Studies, the Institute of Oriental Manuscripts RAS. In October 2017, entered the PhD course at the Institute of Oriental Manuscripts RAS. Major: Historiography, Study of Historical Sources and Methodology of Historical Studies. the title of the Dissertation: “Anonymous “History of Crimea” (B 747) from the Collection of the IOM RAS: its Authorship and Sources”, supervised by Dr. I. V. Zaytsev. 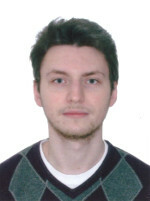 Major research interests: the history of the Ottoman Empire, the history of the Turkic peoples.